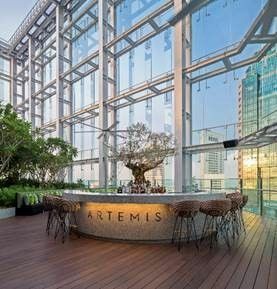 Usher in the New Year on Thursday, 31 December 2015 with a delectable evening of merriment at Artemis Grill, where saucy, sustainable Mediterranean cuisine collides with fine wines and vibrant views. Enjoy a luscious curation of canapes, champagne and cocktails during Cocktail Hour from 8pm to 9pm on the rooftop Sky Garden Terrace, and savour a sumptuous 8-course degustation dinner with matching wines and free flow champagne at S$348++ per pax. Celebrate the arrival of 2016 with sweeping views of the Singapore cityscape and spectacular fireworks display from the top floor of CapitaGreen. DJ Stephen Day will also be spinning as the night remains young and the sky is truly the limit. For more information, please visit 'www.artemisgrill.com.sg'. Please also see additional attached images on the view from Artemis Grill and the NYE menu. Please contact Daphne at Tel: 9817 3561 or email: daphne.hi@mslgroup.com, if you have any further queries.